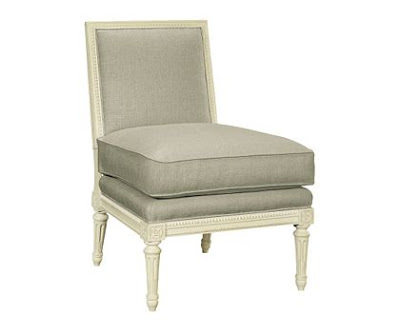 Southern Chateau: You Need a Slipper Chair in Your Life! I love chairs of all kinds. I am known to bring home any stray chair that I feel is orphaned and needs a good home. 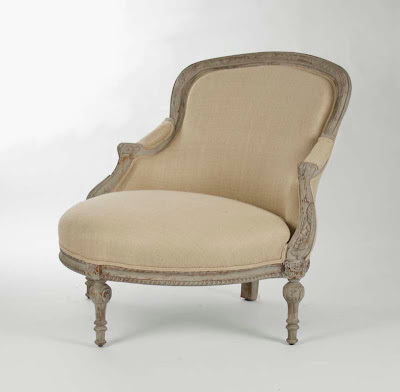 Little antique French ones are favorites and are sprinkled around my house. But another type of chair that I cannot resist is a cute little slipper chair. Every house needs a least one somewhere. Slipper chairs have quite a romantic back-story, as they are said to have served the function of giving Victorian ladies a low, armless chair on which to sit while putting on stockings and shoes. The lack of arms made room for the billowing skirts worn in those days. 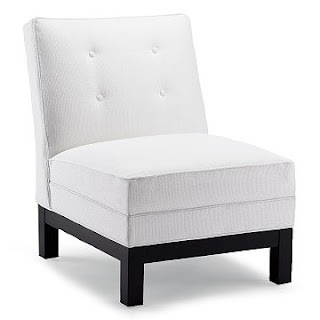 I just know that aesthectically a slipper chair is very pleasing to me. Slipper chairs are just so versatile because of their small scale. You can tuck them into so many places in a room. It can often be a good solution for treating an awkward corner. Pairing a slipper chair with a small drink table, as in the photo above, creates a cozy reading spot. This is a cell-phone shot of a similar chair I snapped at a recent furniture show. This chair is from Lee Industries. I wanted to illustrate how, even when there is button-tufting present, a pretty print fabric such as this blue-and-white ikat style, looks great. So pretty! I think this little chair is just so unique and stylish. 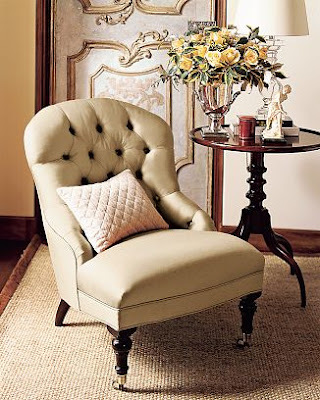 More button-tufting and legs with casters, two of my favorite style details. How about this for something truly different and utterly feminine? I love it in a neutral linen like this and it would be fantastic in a large scale print as well. This is a little antique slipper chair I have owned for a very long time, from back when finding something like this was rare, before French reproductions became so common. It is done in needlepoint. This slipper chair has a very classic, sophisticated feel which I think would look great done in a living room in a pair, side-by-side. This is a more contemporary version consisting of cleaner, straighter lines and a little larger scale. I'm more of the curvy persuasion myself, though! 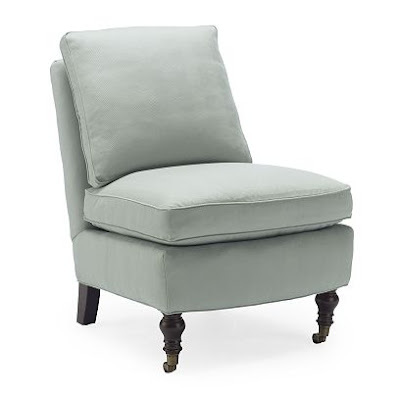 If something seems missing in your life, maybe adding a delicious little slipper chair to your decor will brighten things up. You never know! 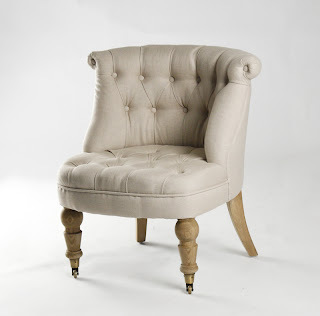 I love a slipper chair! You have some beauties here! Thanks Mona and Renae! Too good to resist aren't they? Beautiful chairs! Lovely blog, too!